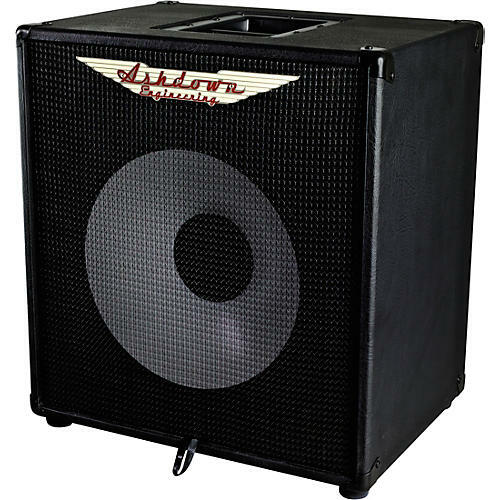 The Ashdown Rootmaster EVO 115T unleashes 300W at 8 ohms of deep bass sound through its single Ashdown 15 in. speaker, bringing the bass to the front of the mix with comfort and standing out from the crowd with its distinctive, high-quality finish, coupled with a dramatic reduction in weight. Ashdown Rootmaster EVO cabinets are now loaded with custom Ashdown White Line speakers for exceptional attack, clarity and low-end performance. Tonally, the compact design maintains the low-end response with a more dynamic mid range. The addition of the tweeter provides extra high end and can be adjusted either to either hi, low or off with the three-way tweeter switch depending on the player’s preference. The new Rootmaster EVO cabs are made from light-weight ply to cut down on weight without risk to the signature Ashdown sound. A solid slim-line construction is paired with mindful design features such bar handles for ease of transport and easy stacking. The cabs are finished in Buffalo Tolex with a black cloth grill for a quality finish that truly stands out from the crowd.